^ ﻿Health at a Glance 2013﻿ (Report). OECD. (2013-11-21). p. 87. doi:10.1787/health_glance-2013-en. ^ Amy Berrington de González and Sarah Darby (2004). “Risk of cancer from diagnostic X-rays: estimates for the UK and 14 other countries”. The Lancet 363 (9406): 345-351. doi:10.1016/S0140-6736(04)15433-0. http://www.imre.ucl.ac.be/rpr/lancet-363.pdf. ^ 澤田聡, 渡邉直行, 五十嵐均 (2011). “"Risk of Cancer from Diagnostic X-rays : estimates for the UK and 14 other countries" : Lancet論文レビューと診療放射線技師による放射線防護の立場からのCT検査妥当性についての考察”. 群馬県立県民健康科学大学紀要 6: 73-76. NAID 110008148682. "日本においてCT検査数が多い理由として、CT装置の設置台数が他国に比べてとびぬけて多いという事実がある7)。…（中略）…医療機関側に立てば、高額医療機器の導入コストをどう減価償却するかという背景を含んでいる。"
^ 2010/11/16号◆クローズアップ「肺癌検診における低線量CTがヘビースモーカーの死亡率に明らかな有効性をもたらす」, “海外癌医療情報リファレンス”, 一般社団法人 日本癌医療翻訳アソシエイツ, (2010年11月23日), https://www.cancerit.jp/650.html 2017年10月8日閲覧, "肺癌検診のリスクが潜在的利益と並んで存在し、それも将来の推奨に織り込む必要がある。この試験のスキャン全体の約25％が偽陽性結果を示しており、これは、認められた異常が経過観察時に癌でないと判明したということである。偽陽性と判定された患者は全員、高線量の放射線を用いる診断用CTから肺生検にわたる、何らかの診断法を経過観察時に追加で受け、中には開胸術（胸部の外科的切開）を受けた患者もいる。これらはいずれもリスクをもたらすものであると Giaccone氏は説明した。"
^ Lucy Forster et al. (2002). “Natural radioactivity and human mitochondrial DNA mutations”. PNAS 99 (21): 13950-13954. doi:10.1073/pnas.202400499. http://www.pnas.org/content/99/21/13950.full. ^ Lene H.S. Veigaa and Sérgio Koifman (2005). “Pattern of cancer mortality in some Brazilian HBRAs”. International Congress Series 1276: 110-113. doi:10.1016/j.ics.2004.11.046. ^ Amy Berrington de González et al. (2009). “Projected Cancer Risks From Computed Tomographic Scans Performed in the United States in 2007”. Archives of Internal Medicine 169 (22): 2071-2077. doi:10.1001/archinternmed.2009.440. http://archinte.ama-assn.org/cgi/content/full/169/22/2071. ^ R. Doll and R. Wakeford (1997). “Risk of childhood cancer from fetal irradiation”. 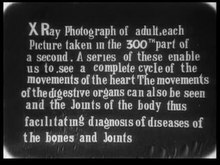 The British Journal of Radiology 70 (830): 130-139. http://bjr.birjournals.org/cgi/reprint/70/830/130. "It is concluded that radiation doses of the order of 10 mGy received by the fetus in utero produce a consequent increase in the risk of childhood cancer."